Fr. Matthew Hincks, ORC:Fr. 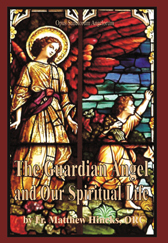 Hincks explains 12 practical ways of bringing the Guardian Angel into our everyday life. By our conscious cooperation with his inspirations, we will more easily grow in holiness and attain union with God.